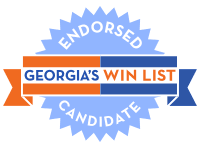 Georgia’s WIN List is proud to announce our endorsement of 2015-16 Lowndes County Teacher of the Year and Army veteran Dr. Treva Gear for the House District 175. During a special election for this seat in February 2018, she was the only Democrat running against three Republican men and placed second. Treva never really suspended her earlier campaign efforts and has spent these past few months visiting churches, attending festivals or community meetings, and making connections for a strong grassroots campaign leading up to this November. She is particularly excited to have an energetic group of Valdosta State University fraternity and sorority students volunteering for her. The district includes all of Brooks County and portions of Lowndes and Thomas Counties. Cities and towns in the district include Barney, Barwick, Boston, Dixie, Hahira, Morven, Pavo, Quitman, Thomasville, and Valdosta. Brooks County sits at the heart of the district and struggles from the highest levels of poverty and struggles with attracting quality industry. “The strength of our district is based upon how well we take care of our most vulnerable members – children, senior citizens, and the disabled. District 175 has great potential for economic growth. There are parts of our district that thrive while other parts barely survive. The factors – the broken bootstraps – that hinder progress for all people are the base of my commitment to District 175. By advocating for and voting on legislation which eliminates these issues, we can all pick ourselves up with new bootstraps. These new bootstraps will involve expanding Medicaid, a living wage, and access to quality job and educational opportunities,” Treva says. Minimize standardized testing in K-12 by focusing more on the learning which occurs throughout the year as exhibited by benchmark tests and common assessments. Standardized testing robs teachers and students of time spent teaching and learning. Provide needs-based scholarships to Georgia’s high school graduates. HOPE is currently merit-based and requires that high school students have a 3.0 GPA and they must have taken at least four Advanced Placement (AP) or advanced level math, science, social studies, or English classes. Minority students and economically disadvantaged students are not often chosen for advanced courses, which prevents their eligibility for HOPE despite having a 3.0 GPA. Create a renewed focus on career development through coursework, exploration, and emphasis from primary school to high school. It is important that students have an idea of their strengths, weaknesses, and career interests upon graduating from high school. She proposes increasing the number of counselors, especially at the high school level. Ensure that teachers are receiving competitive pay with regular, gradual pay increases to account for increases in the cost of living. Teachers have spent more than a decade without a cost of living raise while battling furlough days which further cut into their take-home pay. In the state of Georgia, teachers should not have to worry about having enough money to pay their bills or contemplate taking a second job. Georgia women like Treva are making history in this midterm election cycle as they run for seats long held by Republicans. With women in record numbers on the ballot this year, WIN List needs your help to elect these women and train the candidates we want to see on the ballot in 2020 and beyond.